Valhalla (Old Norse: Valhöll, "hall of the slain") is Odin's hall in Norse mythology, where it provides a posthumous home for those slain gloriously in battle. These warriors, known as einherjar, are welcomed by Bragi (the god of skaldic poetry) and are given a seat at any one of a multitude of tables, where they are plied with roasted boar and endless mead by the beautiful Valkyries. Each day, these deceased warriors exit the hall to do battle with each other, only to be regenerated at sundown, which allows them to feast through the night and fight again the next day. It should be noted, however, that this constant strife is not purposeless, as it can be seen as training for the role that the einherjar will play in fighting alongside the gods at Ragnarök. It should be noted that "Valhalla" is a nineteenth-century English mistranslation of the singular Valhöll into a genitival plural form. While a more literally correct English translation would be "Val-hall," the term "Valhalla" has come into general use. As an important mythic locale, Valhalla belonged to a complex religious, mythological, and cosmological belief system shared by the Scandinavian and Germanic peoples. This mythological tradition developed in the period from the first manifestations of religious and material culture in approximately 1000 B.C.E. until the Christianization of the area, a process that occurred primarily from 900-1200 C.E. Further, their cosmological system postulated a universe divided into nine interrelated realms, some of which attracted considerably greater mythological attention. Of primary importance was the threefold separation of the universe into the realms of the gods (Asgard and Vanaheim, homes of the Aesir and Vanir, respectively), the realm of mortals (Midgard) and the frigid underworld (Niflheim), the realm of the dead. These three realms were supported by an enormous tree (Yggdrasil), with the realm of the gods ensconced among the upper branches, the realm of mortals approximately halfway up the tree (and surrounded by an impassable sea), and the underworld nestled among its roots. 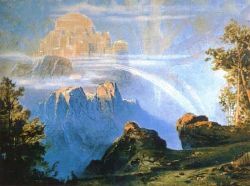 Valhalla, the feasting hall of the Aesir and the gathering place of the honored dead, was an important component of this overall cosmological picture. Odin's hall-shingles, | the shrewd sea-farers. The setting of the hall was also notable, as it was surrounded by a magical forest (Glasir), whose trees bore leaves of reddest gold, and was ensconced by the raging waters of the river Thund ("the roaring"). The hall was also protected by Valgrind (the "Death-Gate"), a portal whose locks would only open for those chosen by the Valkyries. The men who have fallen in fight. On its benches are breastplates strewn. And o'er it an eagle hovers. Thus [Odin] established by law that all dead men should be burned, and their belongings laid with them upon the pile, and the ashes be cast into the sea or buried in the earth. Thus, said he, every one will come to Valhalla with the riches he had with him upon the pile; and he would also enjoy whatever he himself had buried in the earth. Once accepted into this afterlife, these elect (the einherjar ("lone fighters")) continued fighting, each day sallying forth into combat with each other, only to be healed (or resurrected) at the end of the day, which enabled them to fight again in the morrow. It is a testament to the martial nature of their culture that this was seen as an ideal realm. All healed full soon to sit. After a day of battle (and once all the injured and slain have been restored), they all return to the hall for a evening of reveling and merriment. Andhrimnir (the "Sooty-Faced" cook) prepares a meal from Sæhrimnir ("the Blackened"), a divine boar who provides nourishment for all the assembled mortals and gods, and then magically regenerates to allow them to feast again the following evening. 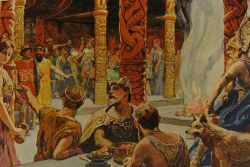 The hall is also home to Heithrun, a magical goat who sups on the twigs of Yggdrasill and produces (instead of milk) udders full of the best mead.</ref> As they feast, the einherjar are waited upon by the beautiful valkyries, who keep their plates full and their ale mugs constantly brimming. While the appeal of this afterlife can be appreciated (when adopting a culturally-relativistic perspective), it was not open to all people. Those who died at home were seen to be relegated to Niflheim, a frigid, shadowy afterlife where they were ruled over by Loki's daughter, the cruel Hel. Given the restrictiveness of the entrance criteria, it is perhaps not surprising that they became somewhat relaxed in Norse religious practice, where Valhalla was seen to be open to "men who show prowess at war and offer themselves up to Odin in their lives and dying acts." As much as the unending conflict described above would have been appealing to many Viking warriors on its own merits, it was not simply undertaken for this reason. Instead, the constant strife enjoyed by the einherjar could be seen as a training of sorts, preparing them to fight alongside Odin at the cataclysmic battle of Ragnarök. As stated above, the primary role of the constant conflict in the fields surrounding Valhalla was to prepare the dead warriors to fight alongside the Aesir in the world-shattering, eschatological battle of Ragnarök. The surfeit of enormous doors that characterized the hall (described above) could be seen as a necessitated by the realities of this battle, as it would allow the near-endless torrent of deceased human warriors to join the struggle as quickly as possible. When to war with the wolf they go. Baldr and Hoth dwell | in Hropt's battle-hall. The "Hroptr" mentioned in this passage is simply an epithet for Odin, meaning "god" (or perhaps "tumult"). 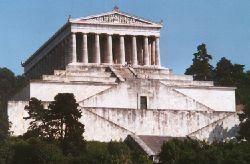 In the early nineteenth century, King Ludwig I of Bavaria, inspired by the Germanic conception of Valhalla, ordered the construction of the Walhalla Temple, which was to be a place of honor for historically notable Germanic figures. The inspiring structure, located near Regensburg, Germany, remains an imposing edifice and continues to be a popular tourist attraction. ↑ Lindow, 6-8. Though some scholars have argued against the homogenizing effect of grouping these various traditions together under the rubric of “Norse Mythology,” the profoundly exploratory/nomadic nature of Viking society tends to overrule such objections. As Thomas DuBois cogently argues, “[w]hatever else we may say about the various peoples of the North during the Viking Age, then, we cannot claim that they were isolated from or ignorant of their neighbors... As religion expresses the concerns and experiences of its human adherents, so it changes continually in response to cultural, economic, and environmental factors. Ideas and ideals passed between communities with frequency and regularity, leading to and interdependent and intercultural region with broad commonalities of religion and worldview” (27-28). ↑ See Turville-Petre for a detailed description of the hall (54-55). ↑ Snorri Sturluson, Gylfaginning II, Brodeur 14. ↑ Snorri Sturluson, Skáldskparmal XXXIV, Brodeur 145. ↑ See "Grimnismol" (22): "There Valgrind stands, | the sacred gate, // And behind are the holy doors; // Old is the gate, | but few there are // Who can tell how it tightly is locked." Poetic Edda, 93. ↑ "Grimnismol" (8-10), in the Poetic Edda, 89. Bellows, the translator of this tome, suggests that the reference to a wolf and an eagle may refer to carved decorations adorning the doorposts of the divine hall (89 ff.). ↑ Snorri Sturluson, Ynglinga Saga (8), accessed online at Online Medieval and Classics Library. ↑ As Dumézil notes, "in the ideology and in the practices of the Germanic peoples, war invaded all, colored everything" (42). ↑ "Vafthruthnismol" (41), in the Poetic Edda, 80. ↑ See "Grimnismol" (18): "In Eldhrimnir | Andhrimnir cooks // Sæhrimnir's seething flesh, // The best of food, | but few men know // On what fare the warriors feast" ; and "Grimnismol" (23) "Heithrun is the goat | who stands by Heerfather's hall, // And the branches of Lærath she bites; // The pitcher she fills | with the fair, clear mead, // Ne'er fails the foaming drink." Poetic Edda, 92, 94. See also Snorri Sturluson, Gylfaginning XXXVIII-XXXIX, Brodeur 50-52. ↑ Snorri Sturluson, Gylfaginning XXXVI, Brodeur 47-48. ↑ "Grimnismol" (23), in the Poetic Edda, 93. ↑ "Grimnismol" (21), in the Poetic Edda, 93. ↑ Snorri Sturluson, Gylfaginning LII, Brodeur (82). ↑ "Völuspá" (62) in the Poetic Edda, 26. Grammaticus, Saxo. The Danish History (Volumes I-IX). Translated by Oliver Elton (Norroena Society, New York, 1905). Retrieved from The Online Medieval & Classical Library January 14, 2016. The Poetic Edda. Translated and with notes by Henry Adams Bellows. Princeton: Princeton University Press, 1936. Retrieved from Sacred-texts.com January 14, 2016. This page was last modified on 14 January 2016, at 21:41.